The most common questions I get asked about 5 gallon buckets are regarding their dimensions. I’m hesitant to answer questions on the dimensions of a 5 gallon bucket because it will vary between models, sometimes significantly. 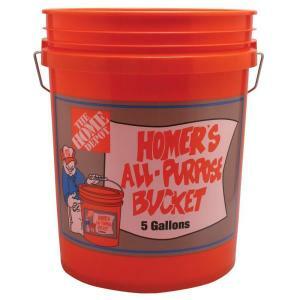 So this article is an attempt to catalog the most popular 5 gallon buckets in use today, along with their weights, measurements, capacities and anything else relevant. I’ll also be linking to the manufacturers’ specification sheets where available so you can delve much deeper into bucket statistics. This page is a constant work in progress – we will add more manufacturers as they are brought to our attention. For each manufacturer, we will publish the dimensions of their most popular bucket only, and link to spec sheets for the rest. Where available, I’ve included the bucket weight as an indicator of sturdiness. This company has much more information publicly available than any other company I’ve come across. We encourage you to take a look at these spec sheets for general data regarding stacking dimensions, maximum weight capacity, shipping pallet analysis and tons of other fun data. Where can I recycle my old 6 gallon buckets for cash? I dont know any recycling places that give you money for them. You could try selling them on craigslist – you never know who is looking for cheap buckets. I do have leakage! and am looking for a replacement. I have a stepcan used for compostables in the kitchen. It has a galvanized 5 gal. bucket w/wire handle; 9″ diam by 24″ high NO TAPER. The bottom has rotted, I need a plastic replacement & can’t find one — plastic because the compost reacts with the metal. Plastic bags are contrary to the whole idea. Thanks to anyone w/ a find or solution. They make a 9 inch diameter pvc pipe. U would have to find a cap that will fit into the inner diameter of the pvc. If money is an issue or your wanting to stay as green as possible try stopping at a construction sites and seeing if they have scraps you can sift through. The 9 inch pvc is sometimes used for water lines and a 24 inch or longer piece would not be that uncommon for them to throw away. 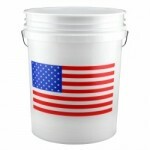 LOOKING TO BUY CHEAP 5 GALLON PAILS THAT DO NOT CONFORM TO THE UN/US STANDARDS IN QUANTITIES. The measurements you give for the Home Depot bucket yield a volume of 1586 cu. in., or almost 6.9 gallons. I measured the internal height and width (11.25 in and 14 in, respectively), giving me a volume of 6 gallons. I’m not sure how this is sold as a 5 gallon bucket, however. Would anyone know the rated weight limit a 5 gallon bucket can handle when used for sitting on. 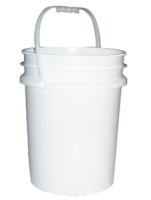 Any plastic 5 gallon bucket round or square? Round or square which one is stronger? What size of thickness bottom of 20 liters galon in plastic industrial? have a unit error for the wall thickness in the first table but love. The information. Thanks! I am trying to find out the size of a pop top lid for a 5 gallon bucket. Specifically it is a 5 gallon bucket top pour spout to a concentrated dawn detergent. It is not a screw lid. My reason for needing this is so that I can order the correct pump spout that will seat and seal with the pour spout part on the lid. …to clarify it is the approx. 2″ area where you pour from a closed lid.